I've been trying to branch out a little in the world of British baking, and I settled on millionaire's shortbread as my first target. It is one of those classics, sold near the check out line of almost every grocery store in the UK, and something I had never really thought to try in the states. I chose a Mary Berry recipe for my first attempt at it (she is as British as it gets right? 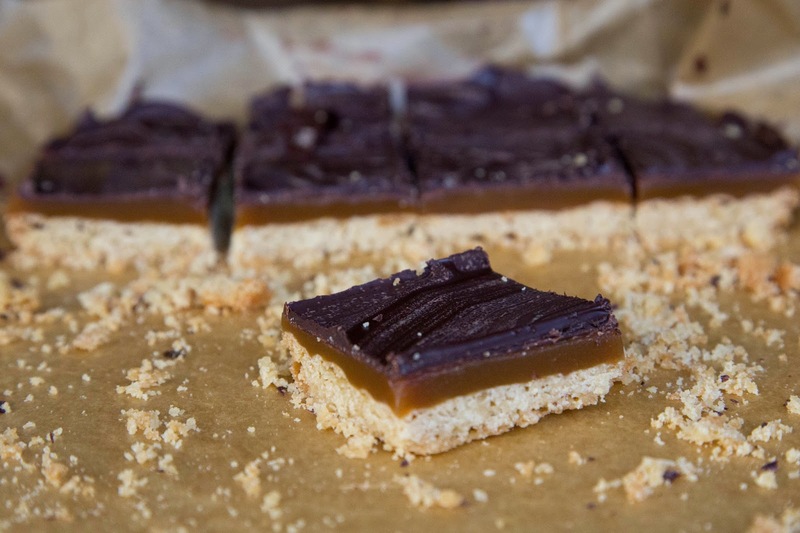 ), and while I found her shortbread lovely, I really struggled with the caramel. Most of the recipes I found used condensed milk for the caramel base, and I tried it at least 3 times and could not get it right. It seems to take longer to cook then expected, and then burns very easily. I'm not the biggest fan of the flavor of condensed milk anyways, so I went back to one of my classic caramel recipes, and got a great result. For both the shortbread and caramel I replaced some of the white sugar with brown sugar, and was very happy with the resulting taste. 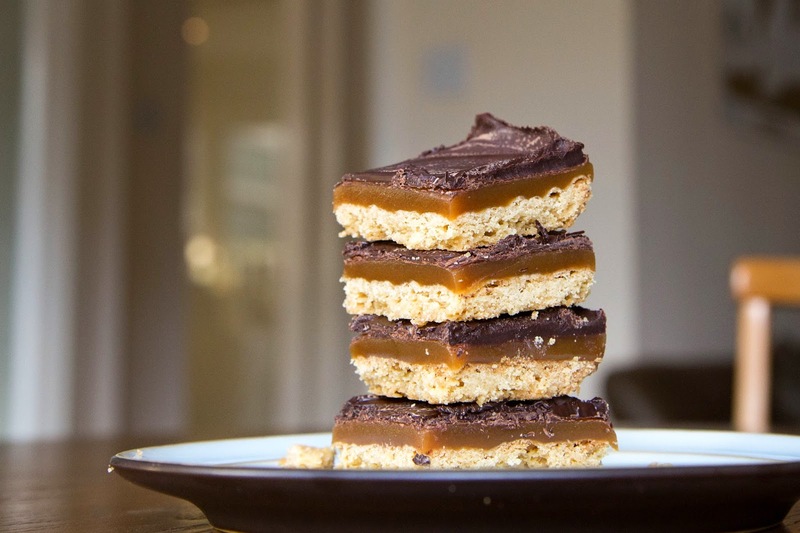 Millionaire's shortbread is all about the textures and flavors - a crumbly crunchy short bread, topped with a chewy caramel, and a thin layer of crisp chocolate on top to fill it out. While its hard to go wrong with chewy caramel and chocolate, I have to say, this is pretty delicious. And the simple shortbread base, with just 3 ingredients is great on its own too! This caramel does require a candy thermometer to make from scratch. 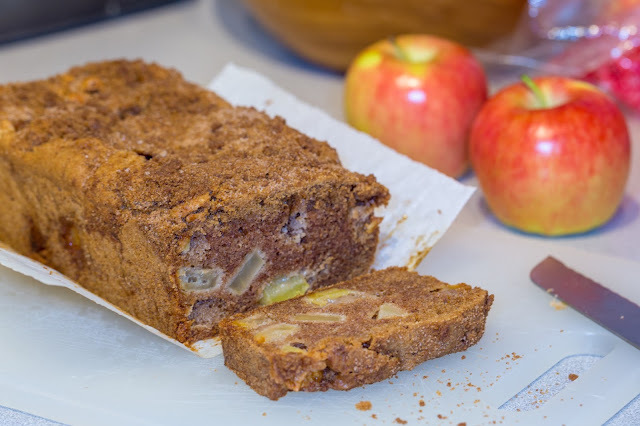 However, a few times I made it and cooked it a little too long, and while the it came out firmer than ideal, it was still devoured and heavily complemented (and delicious). So I'd say don't be scared of candy making! Give it a go, and if you are nervous, keep the temperature lower so it comes to temperature slower. As in my previous caramel recipes, if you are in the US you could melt down kraft caramels with heavy cream for this layer, follow this link for those instructions.